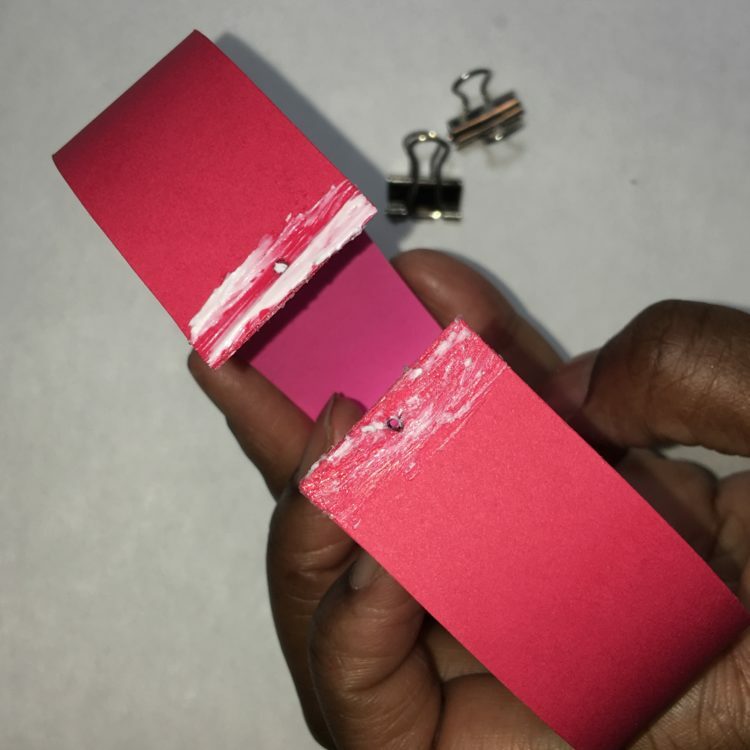 This has been my favorite Valentines Day card DIY for a few years now. I love the fact that it is 3D. It also looks fabulous sitting on the desk. 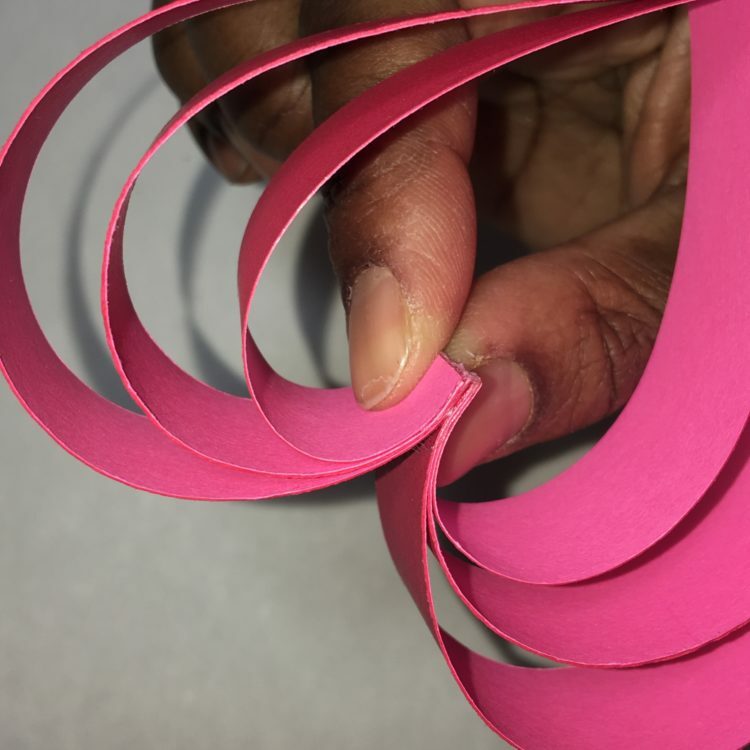 Plus it is very easy to make and can be made with very simple materials, most of which are everyday items. 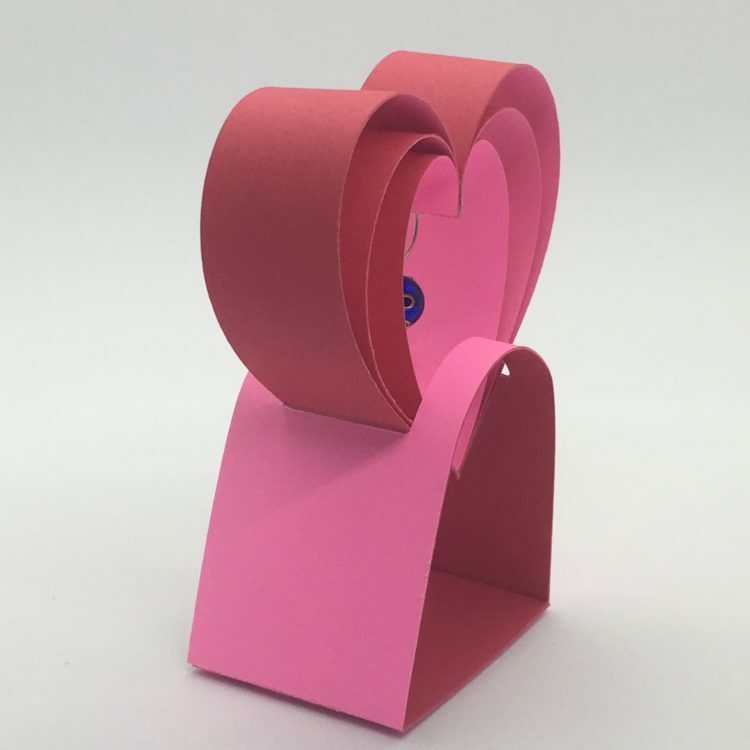 Start by scoring down the center of 1″ wide card stock strips. 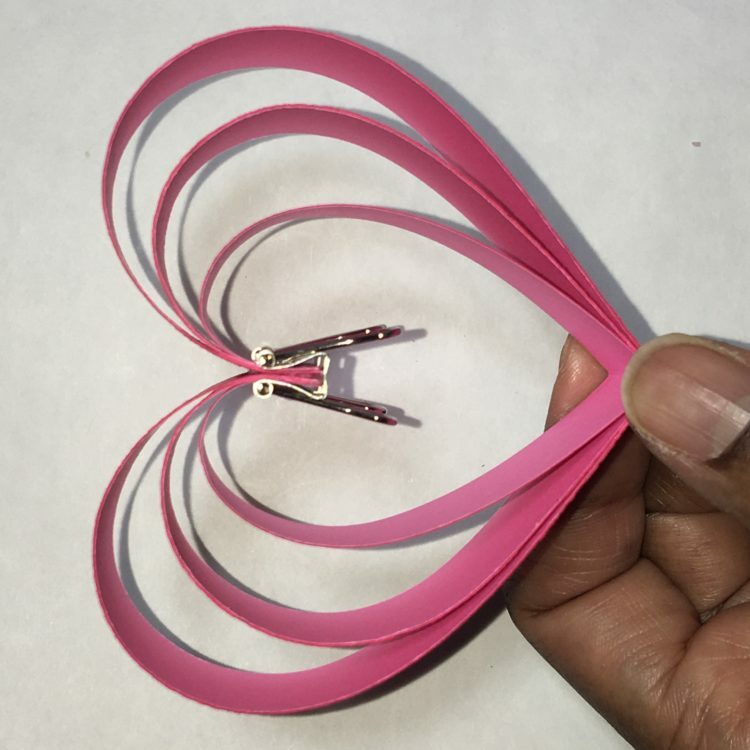 In our case, we used double sided card stock and the pink side will be the inside of the hearts with the red on the outside. Score on the pink side. 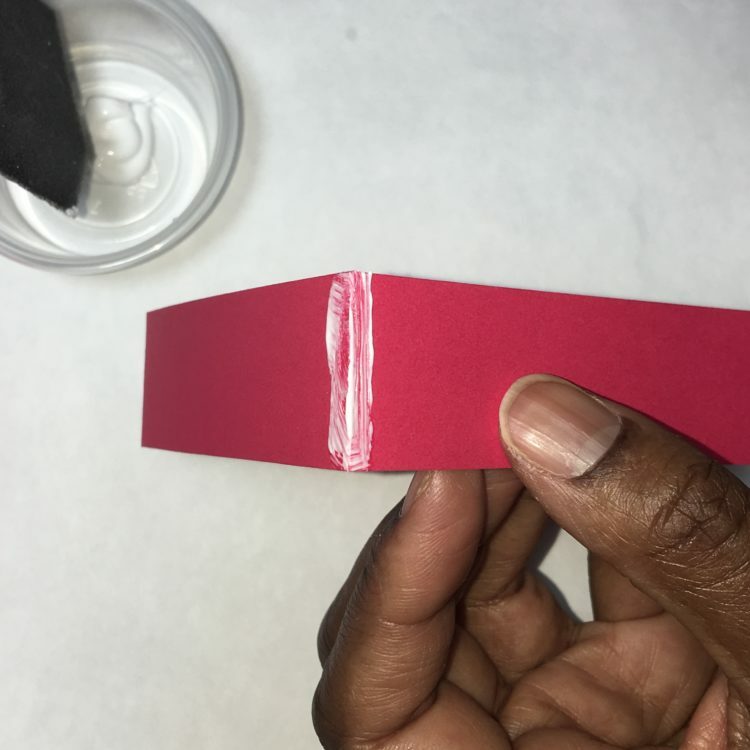 Fold the strips in half making sure you get a sharp crease. 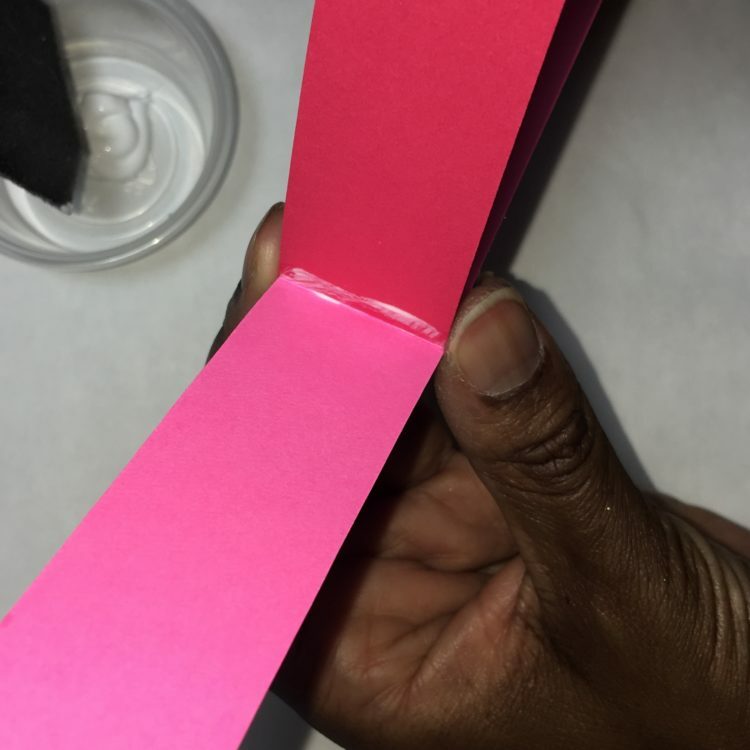 Add a line of glue about 1/8″ inch on either side of the crease, on the 7″ long strip. 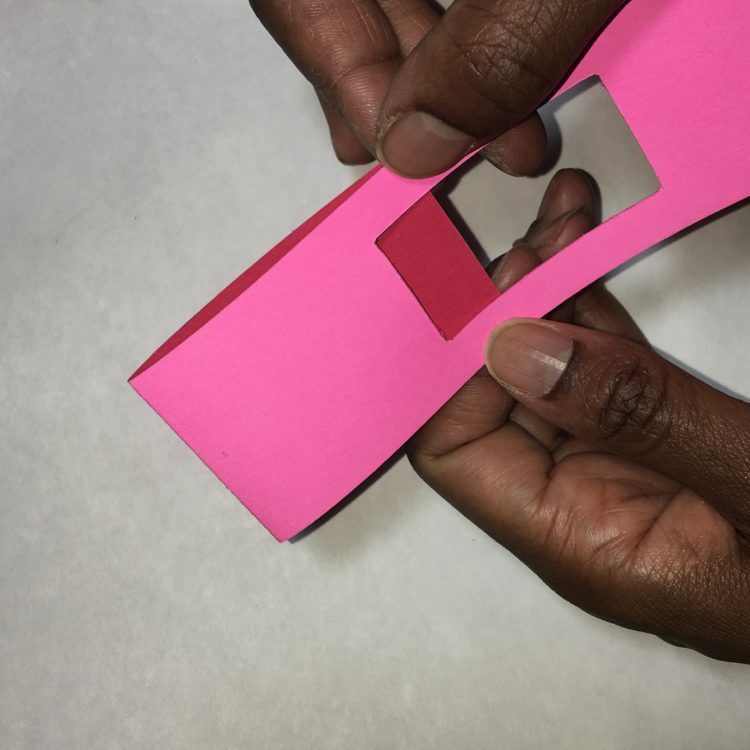 Place the 7″ strip inside the 9″ strip so that the two creases adhere to each other. 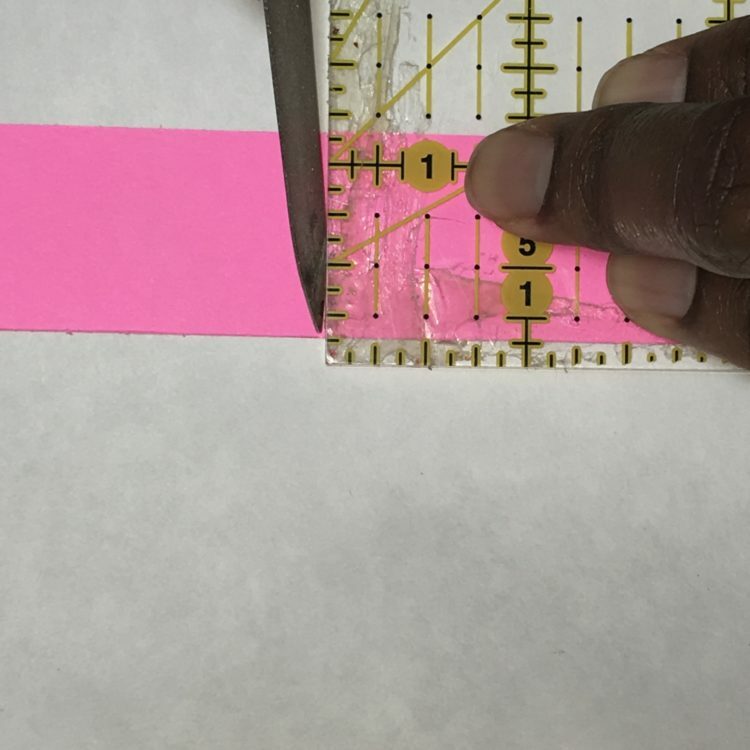 Repeat, placing 1/8″ inch wide on either side of the crease for the 9″ long strip. 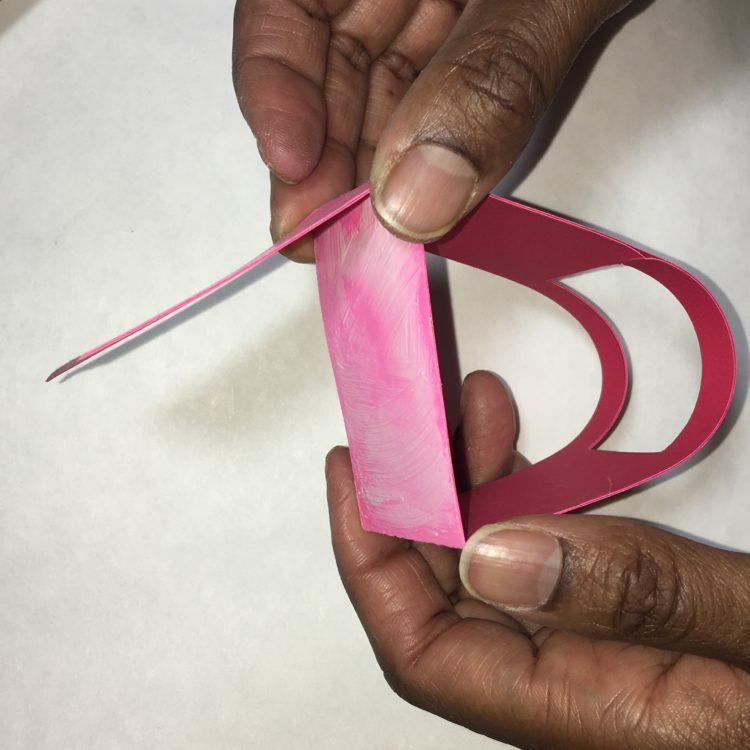 Place inside the 11″ long strip and hold in place for a few seconds making sure to align all the edges. Then place binder clips to hold in place and set aside. Next score 2.5″ from the both edges on the stand. 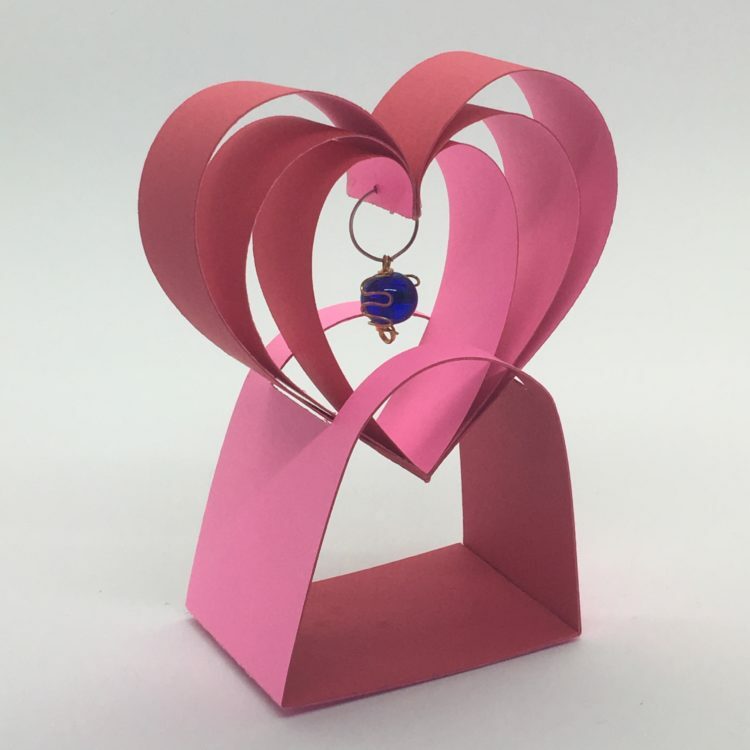 Since the pink is gonna be the outside of the nested heart stand, I scored on the red side and folded it per the photo above. Repeat on the other side. Apply glue to one of the flaps. And press the two flaps together, making sure that the edges stick and then set aside. 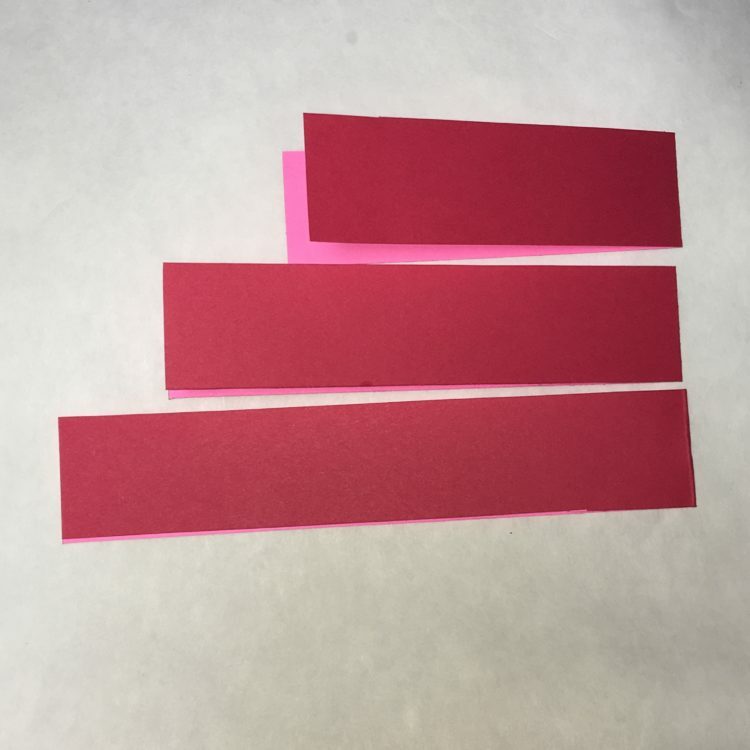 Now back to the 1″ strips. 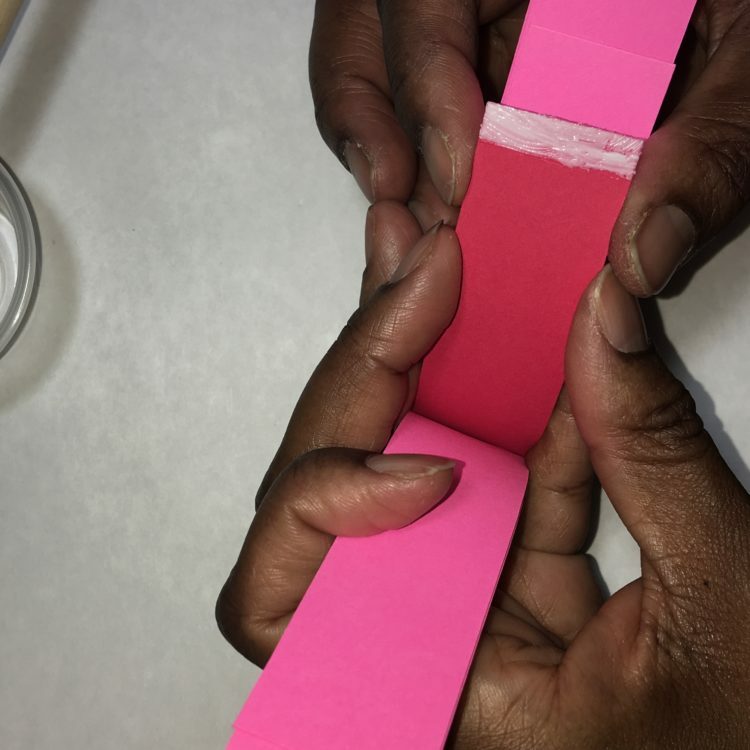 Apply about a 1/4″ wide strip of glue on one side of the 7″ long strip. 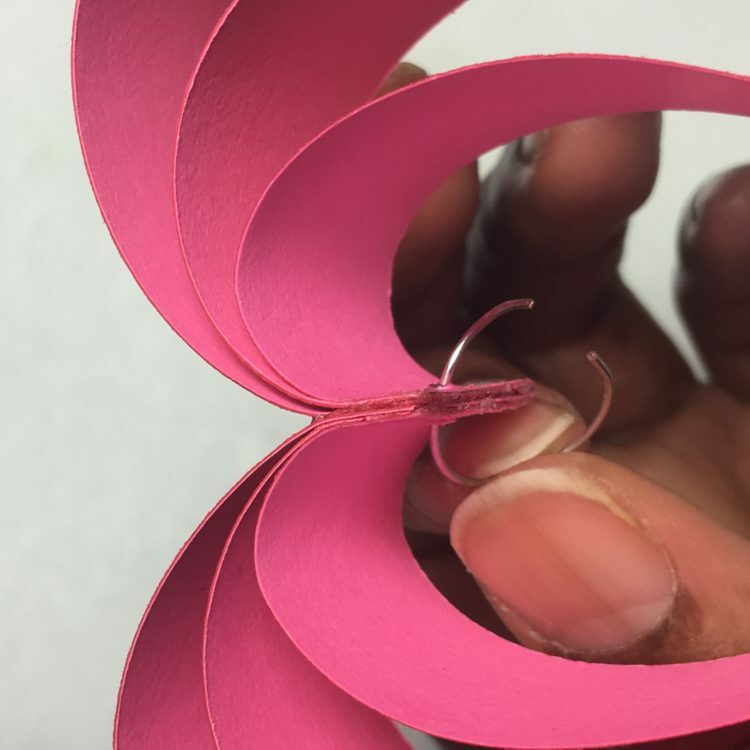 The glue needs to be applied to the outside of the heart, which in this case is the red side. 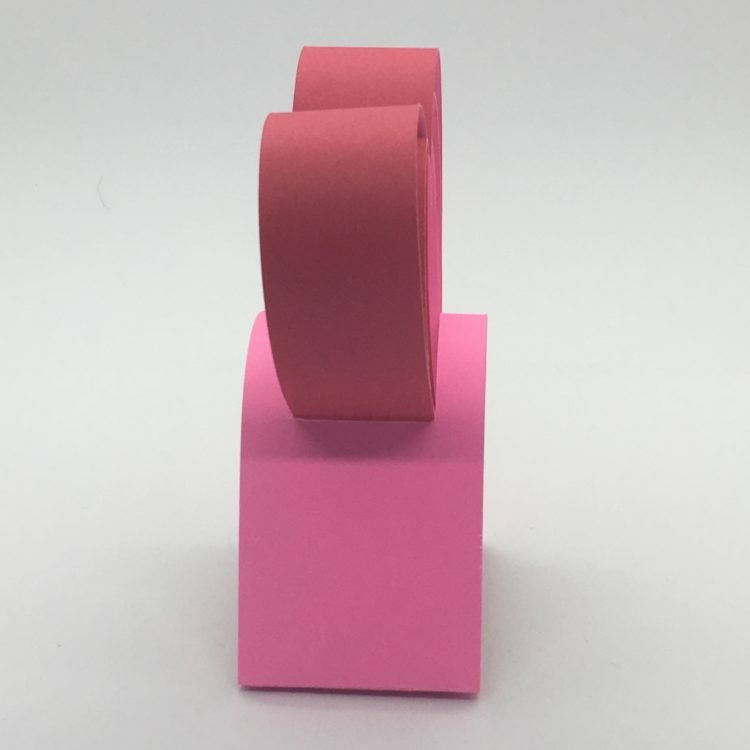 Line up the top edge of the 9″ strip with the 7″ strip and adhere together. 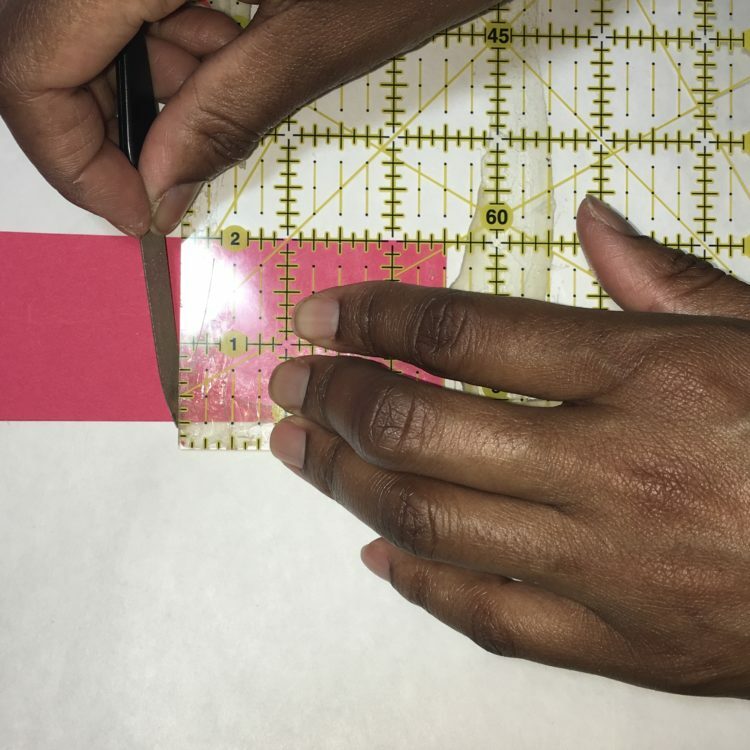 Repeat the process to adhere the 11″ strip on the same side. 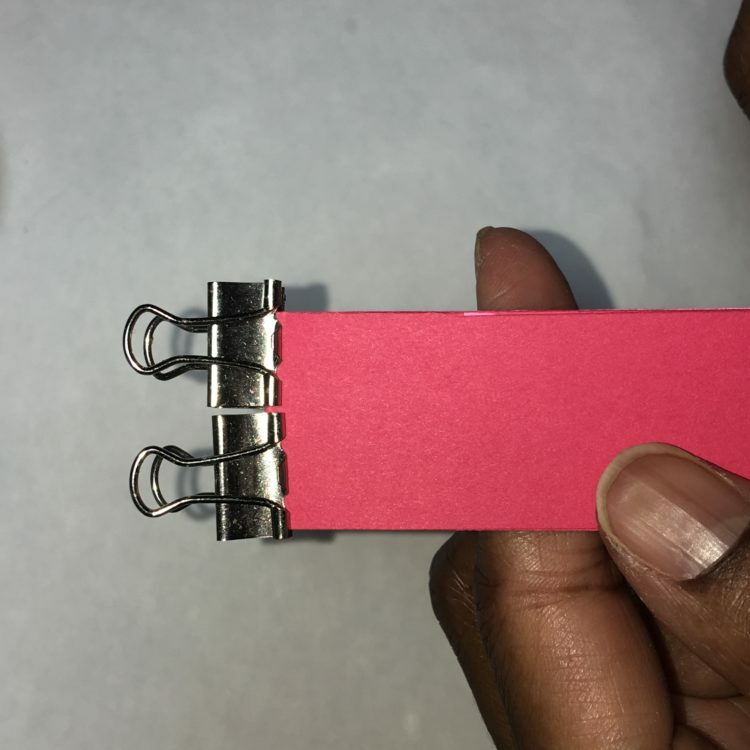 Hold together with a binder clip and repeat the process for the other side. 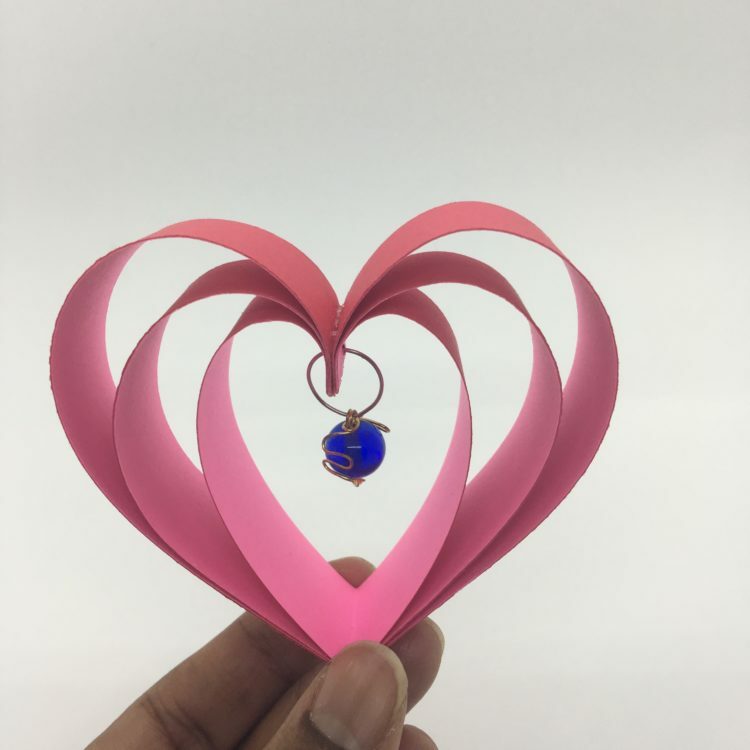 Your hearts should have a similar shape to the photo above. 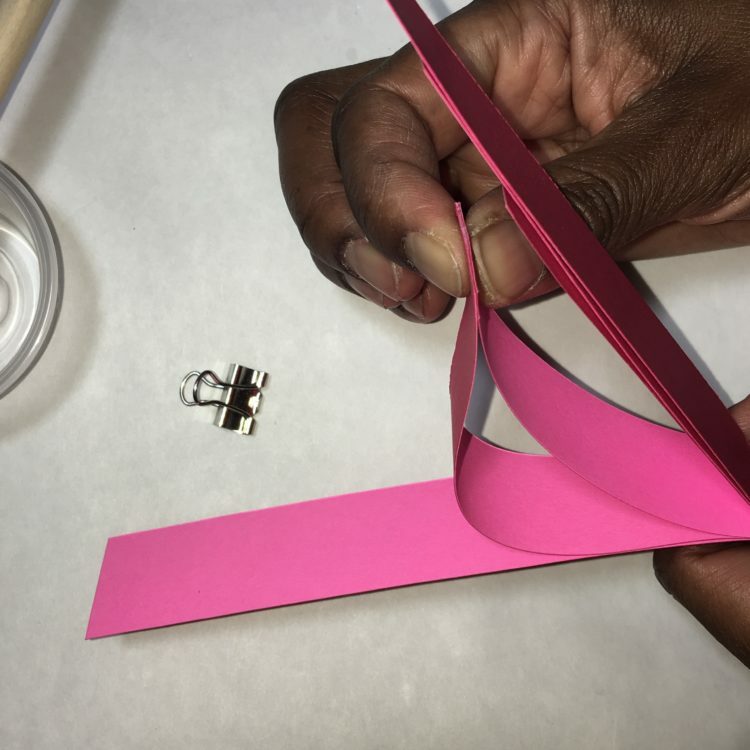 Once each side has adhered together, remove the binder clips and use your hold puncher to create the jump ring hole. 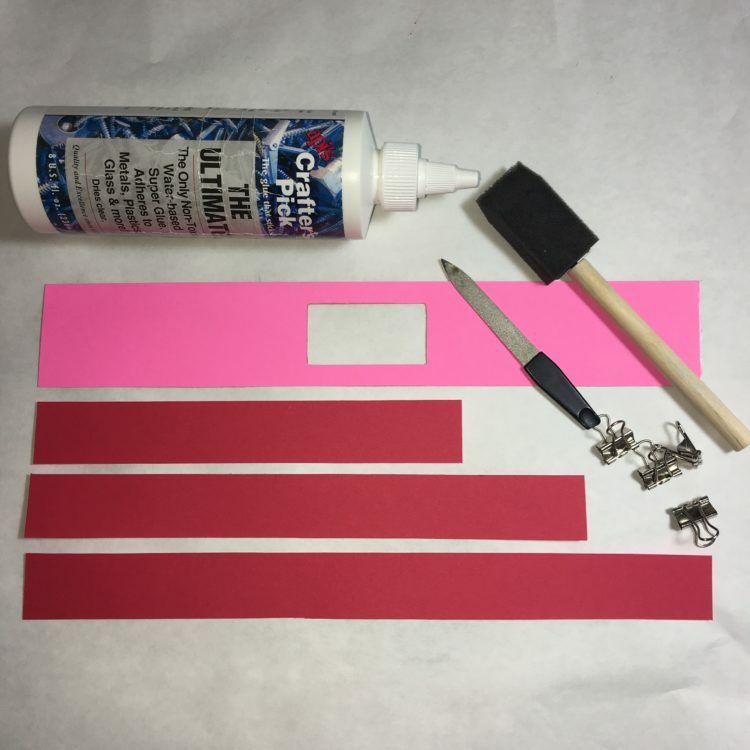 Place a line of glue about 3/8″ wide on both sides on the red side. 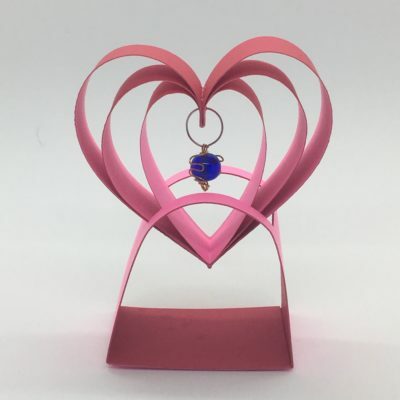 Carefully bring in the two edges to create the heart shape and line up the two edges. 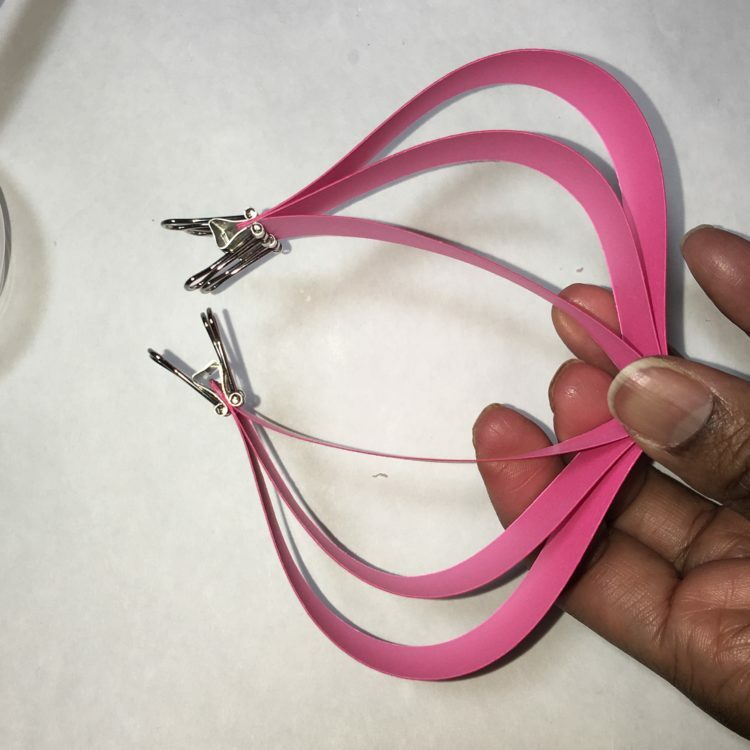 Hold in place with the binder clips. Set aside to dry. 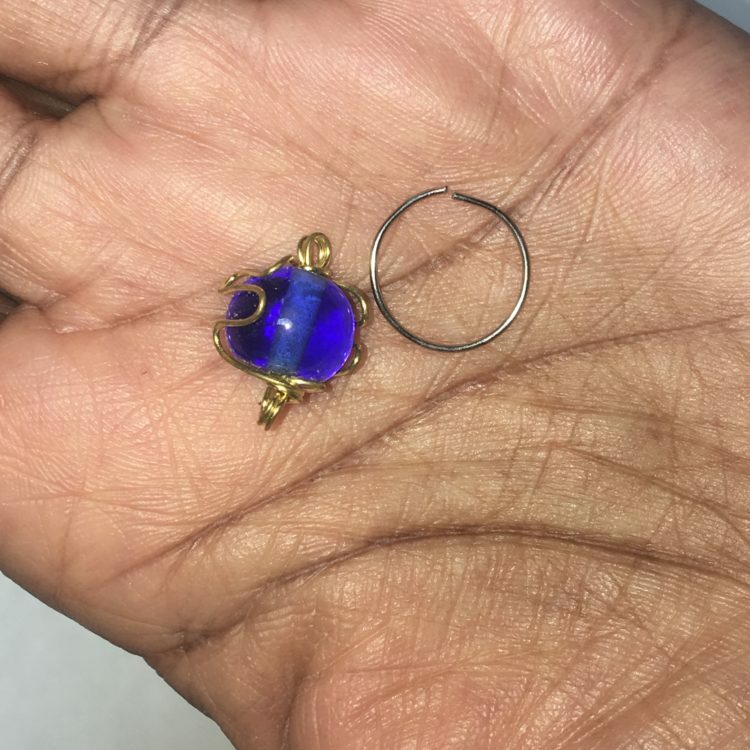 Here is the bead and the jump ring. Open the jump ring and slide it through the hole. 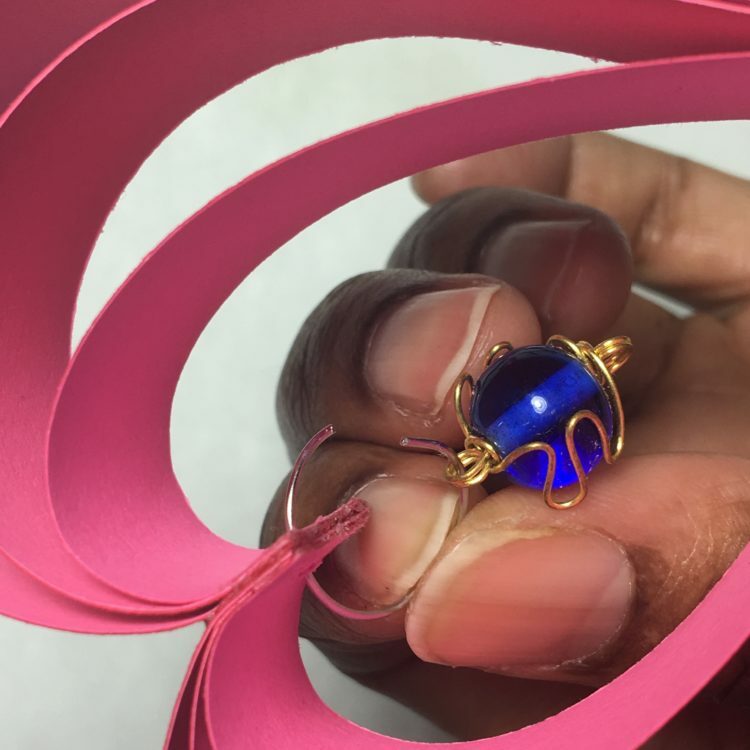 Slide the bead onto the jump ring and close it. Beautiful but one final step. Place the nested heart onto the stand.